(9.1) How is the percentage of disability computed? To whom is it applicable? Percentage of disability assessed by Medical Board. Provided that the above broad banding shall not be applicable to Government servants who are retained in service and are granted Iumpsum compensation. 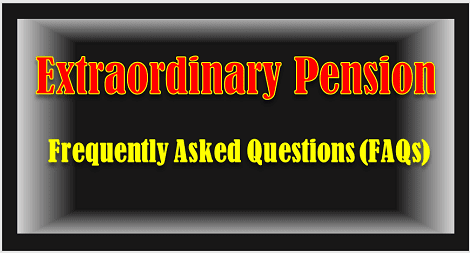 (9.2) How disability pension is different from Invalid Pension? The invalid pension is granted under Rule 38 of CCS(Pension) Rules when the Government servant seek invalidation from service for any bodily or mental infirmity whereas disability pension is granted under CCS(EOP) Rules. The CCS (COP) Rules provides that if a Government servant is boarded out of service on account of injury attributable to Government service he shall be granted disability pension which includes service element as well as disability element. Invalid pension and disability pension cannot be combined. (9.3) What is the revised quantum of ex-gratia lump-sum compensation to Civilian employees who die in performance of their bonafide official duties? (9.4) From which date the Constant Attendant Allowance is payable? (9.5) Whether the pensioners who retired on disability pension before 1.1.2006 would also be entitled to Constant Attendant Allowance ? Yes, the pensioners who retired on disability pension before 1.1.2006 and fulfilling the conditions mentioned in para 10.1 of OM. No. 38/37/08- P&PW§A) dated 2.9.2008 would also be entitled to Constant Attendant Allowance. (9.6) Whether Dearness Relief will be admissible on Constant Attendant Allowance?